On May 14, 1948, Israel declared its independence. Although it is not unprecedented in history that countries gain their independence through war, either by conquest or by flinging off the yoke of colonization, there are few examples in history that match the circumstances under which Israel was created. The Palestinians, the people at whose expense the Jewish state was established, have another word for Israel’s Independence Day – Al Nakba or The Catastrophe. In a matter of months, over 800,000 Palestinians fled or were expelled from their homes throughout Palestine. Hundreds of others were massacred by Jewish gangs in Deir Yassin and Ein Al Zaytoun as a tactic to terrorize people into fleeing. Villages were destroyed, people killed and homes left behind as horrified Palestinians fled the fighting between Jewish troops, Arab armies and Palestinian resistance groups, believing they would be allowed to return home in a matter of days. That was not to happen. As Jewish troops continued to launch attacks against both Palestinian resistance groups and unarmed civilian populations, pushing back the much weaker and far less organized Arab armies, more and more people fled the battle scenes, crossing borders in the north into Lebanon and Syria, across the river into Jordan and into the West Bank and Gaza in the south. As the fighting raged on, little did the Palestinians, the Arabs or even the international community realize a deep-rooted problem that would prove to be one of the thorniest issues in the Palestinian-Israeli conflict, was in the making. Still, even after the war ended and Israel declared its independence, the hundreds of thousands of Palestinians who had left behind their entire lives still believed they would be allowed to return home. Thinking they would only be away from their homes for a few days at most, people took the bare minimum, trudging across the borders with thin mattresses slung over their backs, children on their hips and the keys to their homes securely hanging from their necks. And as history will later lend evidence to, this was just one of the many hypocrisies perpetrated by the international community and Israel against the Palestinians. Not only was the resolution disregarded by the fledgling Jewish state, it was swept under the rug by the West and the rest of the world. Fifty-eight years later, Palestinians across the board are asking for no more than for UN resolutions to be enforced as they so often are in other areas of conflict. However, as it became apparent that the refugees would not return to their homes in Palestine, now either destroyed or inhabited by new Jewish immigrants, the world was at least obliged to deal with the disaster that had come into being. On December 8, 1949, UN General Assembly resolution 302 (IV) called for the establishment of UNRWA, the UN Relief and Works Agency for Palestine Refugees. 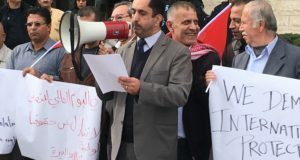 The agency has since provided homes, schools, food and work for the approximately 4.3 million registered Palestinian refugees throughout its areas of operation. Now, 58 years later, the double standards of Israel – the self-proclaimed democracy of the Middle East – and the world at large have never been so stark. As Israel celebrates its day of independence, the Palestinians continue to languish in sprawling refugee camps in Lebanon, Syria, Jordan, the West Bank and Gaza under extremely poor living conditions and even poorer political horizons. 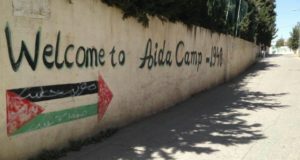 The right of return for Palestinian refugees has been a “national constant” for the Palestinian leadership and people for over half a decade and a most serious sticking point for Israel, which claims it cannot allow the refugees to return to their prior homes for fear that this would sabatoge the demographic composition of its Jewish majority. In addition to the refugee problem, Israel has little to be proud of when it comes to its neighbors, the Palestinians. Crammed into demeaning cantons, each city severed from the next, fighting off poverty, unemployment and international condemnation for resisting 39 years of Israeli military occupation, the Palestinians are clear proof that Israel is a country based on racism and double standards. As it oppresses, occupies and aims to annihilate the national cause of an entire people, it portrays itself to the world as a democracy and a peace-loving nation under fire. Even Israelis themselves have truly come to believe this fallacy. On May 3, as Israelis marked the beginning of independence celebrations, Acting Knesset Speaker Shimon Peres said Israeli citizens can look back on their past with satisfaction. Peres was also quick to add the Palestinians into the mix as well. “I turn, first and foremost, to our neighbors the Palestinians. This evening too we are proffering beautiful days of peace, the squeeze of a handshake of peace rather than a squeezing of the trigger,” he said. After 58 years of displacement, expulsion and oppression, when will the world finally realize that the Palestinians have and continue to be on the receiving end of the gun? Joharah Baker is a Writer for the Media and Information Programme at the Palestinian Initiative for the Promotion of Global Dialogue and Democracy (MIFTAH). She could be contacted at mip@miftah.org.